Apple's iTunes Music Store is already known to be one of the top contributors to the music industry's bottom line, but a new analysis pegs Apple is bolstering the digital music download market to the tune of about $3.4 billion, or 60 percent of digital revenues. This week analyst Horace Dediu, writing for Asymco, parsed recent figures from the International Federation of the Phonographic Industry (IFPI), which represents 1,400 recording industry members across 66 countries. The IFPI reported total music revenues of $16.5 billion for 2012, marking the first growth in music revenues since 1999. Of that figure, $5.6 billion came from digital downloads. 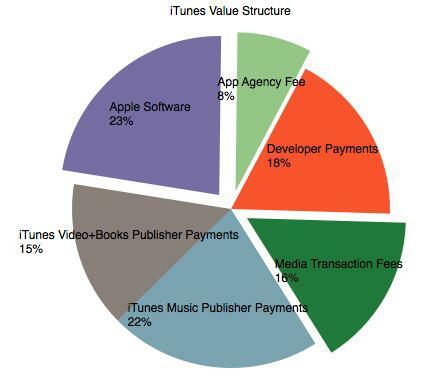 Turning to Apple's iTunes revenues, Dediu estimates that, of the $13.5 billion Apple reported for iTunes revenues, the iTunes Music Store accounted for about $4.3 billion, of which $3.4 billion was paid to music labels. 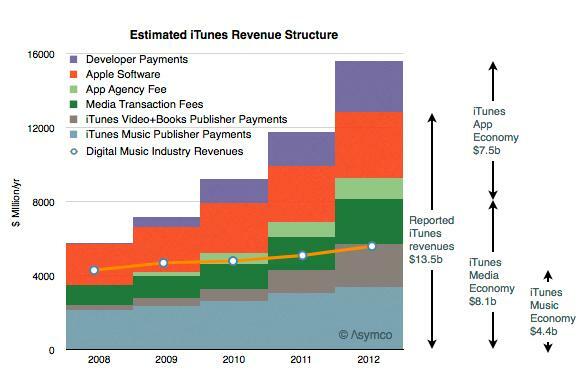 That would amount to roughly 22 percent of iTunes revenue. Initially introduced as a means to provide easily accessible music for iPod owners, Apple's iTunes Music Store has grown into a juggernaut in the music industry. For years iTunes has been the number one music provider in the U.S., and the storefront reached a milestone in selling its 25 billionth song in early February. Dediu estimates that iTunes music revenue is growing at about 10 percent, while App Store revenue is growing at around 50 percent. Video and other revenue, Dediu estimates, is growing at around 90 percent. Historically, Apple has held that the App Store and iTunes Store operate at a break-even rate, as they have largely been just a value-add for Apple's high-margin hardware. Dediu points out, though, that given iTunes increasing revenues, Apple may be generating significant operating margins from software and other iTunes sales.